Raging Battle is a set in the Yu-Gi-Oh! Official Card Game (OCG) and Yu-Gi-Oh! Trading Card Game (TCG). 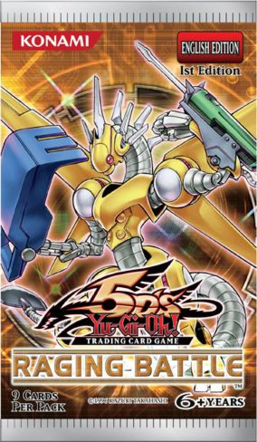 is the fourth set of the OCG's 6th series following Crimson Crisis. It is followed by Ancient Prophecy. This was the final Booster Pack to use AE in its Asian-English print set numbers. Includes cards used by Akiza Izinski, Crow Hogan, Jack Atlas, Leo, Tetsu Trudge, and Yusei Fudo. * The TCG version also includes cards used by Chazz Princeton and Yami Marik. Includes members and/or support for the "Alien", "Blackwing", "Gadget", and "Morphtronic" archetypes. The TCG version also includes members of the "Ojama" archetype. Introduces the "Earthbound Immortal", "Forbidden", "Koa'ki Meiru", and "Power Tool" archetypes to the OCG/TCG.